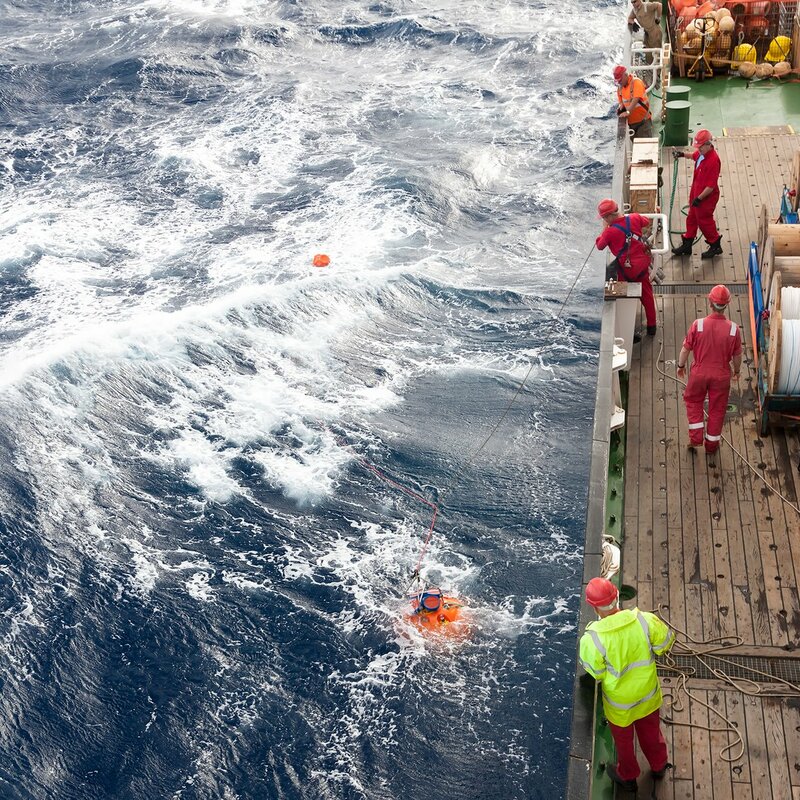 For more than a decade scientists from the National Oceanography Centre in Southampton have been travelling to the subtropical Atlantic to collect data that provide important information about our changing climate. Just 15 miles from the sandy shores and coral reefs of the Bahamas the ocean floor plunges down to depths of over two-and-a-half miles. Along this steep slope dozens of sensitive instruments, known as the RAPID array, are deployed to monitor the currents that bring water as cold as 2°C from the far north of the ocean. In return, warm waters flow north at the ocean surface. It is the difference in temperature that provides the heat which affects our climate. Heat is not the only important quantity carried by these currents. Huge quantities of carbon dioxide (CO2) is also being transported. The cooling of northward-flowing surface waters and intense biological activity in the North Atlantic lead to a strong reduction in concentrations of carbon dioxide at the surface. Together these drive the absorption of CO2 from the atmosphere prior to the waters sinking and returning southwards at depth, flowing past the Bahamas approximately ten years later. The CO2 derived from human activities, such as the burning of fossil fuels, is also taken up as part of this process. In fact, the oceans now remove approximately a quarter of all human-derived CO2, thus slowing the rate of greenhouse gas driven climate change. This year the team from the NOC will for the first time be retrieving data on the transport of carbon dioxide. As global temperatures increase and the oceans become warmer and more acidic, less carbon dioxide will be absorbed by the oceans. These new measurements will help us understand how fast these changes are happening and enable improvements in our capability to predict our climate. Eighteen months ago, during the last expedition, oxygen, pH and pCO2 sensors were deployed alongside autonomous samplers collecting water to be analysed for dissolved inorganic carbon, total alkalinity, inorganic nutrients (phosphate, nitrate and silicate) and organic nitrogen. Until now most of these variables were only measured once or twice per decade. “Now we will have data every ten days, or for some variables, every four hours” explains Dr Pete Brown, “and this is going to radically change our understanding of the variability of the absorption and transport of carbon by the ocean”. Data from the RAPID array on the transport of heat is widely used by climate scientists because the new knowledge and understanding obtained from these measurements helps to validate and to improve climate models. Reduction in uncertainties in model predictions underlines the importance of gathering data to monitor the actual changes. We expect that the new data on CO2 transport will be equally important. Follow the expedition via the blog.